I am about to begin my second year as a master's student at McGill University where I am studying the transport and precipitation of quartz-carbonate vein hosted gold mineralization. I grew up in the town of Penticton, British Columbia where I took a great interest to outdoor activities such as skiing and mountain biking. During my summers, I worked for my father's land surveying company and I think the exposure to both working and recreating outside lead to my interest in natural sciences, in particular, geology. This lead to my eventual decision to pursue a bachelor's degree in Earth and Ocean Sciences at the University of Victoria, which I completed in 2011. During my last summer as an undergraduate student I was fortunate to get a job for a small mineral exploration consulting company where I was given the opportunity to create a geological map and structural interpretation of potential volcanogenic massive sulphide deposit in south central British Columbia. I used this map as the basis of an honour's thesis for my undergraduate degree. After graduation, I spent three years working for Pretivm Resources on their Brucejack gold project in northwest British Columbia. Here, I helped to construct a geological model for the Brucejack deposit and I became more interested in the specific controls on the gold mineralization. At the end of 2013, I became aware of Dr. Christie Rowe's research on amorphous silica phases and their association with gold as a possible mechanism for the formation of very high grade gold veins. I decided to contact her and through our correspondence we were able to set up our current research project with Pretivm Resources. Measured gold concentrations and theoretical gold solubility maxima in hydrothermal fluids are orders of magnitude lower than what is observed at some high-­grade epithermal gold deposits. For example, assays from electrum bearing quartz-­carbonate veins at Pretivm Resource’s Brucejack deposit in northwestern British Columbia, yield gold grades as high 41,500 g/t Au. Deposition of such high grades would require an extremely large flux of gold in solution through a small area even at maximum theoretical concentrations. The motivation of my project is to study whether gold or electrum can be transported as a nanoparticulate solid in suspension (colloid) to allow for a higher total gold flux in order to deposit such concentrations. Rapid precipitation of silica from hydrothermal solutions at structural dilation sites may lock gold particles up in amorphous silica phases such as opal. Recrystallization of opal to quartz pushes any impurities to quartz grain boundaries causing gold or electrum to coalesce at interstitial sites. 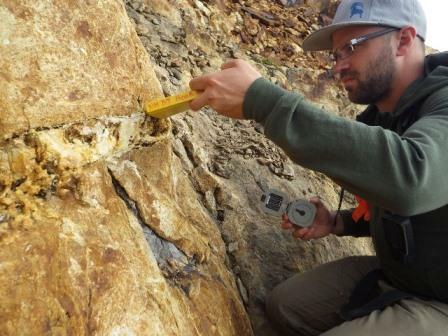 Amorphous silica formed along active faults at Dixie Valley, Nevada, has been documented to contain a few wt.% gold while associated quartz has gold concentrations below detection limits. Any amorphous silica formed at the early Jurassic Brucejack deposit will have recrystallized to quartz. Therefore, it is important to compare textures from this locale to the relatively fresh samples from Dixie Valley. This project will attempt to find textural evidence for colloidal gold deposition at Brucejack and using samples from Dixie Valley, observe how these textures evolve with recrystallization and metamorphism.A rapid drop in fluid pressure is a likely cause of amorphous silica formation and this can occur at site of structural dilation. If the colloidal deposition of gold can be associated with these sites, this will impact how we explore for gold and potentially any other minerals that may be controlled by this process.